The so-called ‘baptism barrier’ is set to be removed by the Minister for Education today. A PRACTICE WHICH allows primary schools to prioritise religion as a criterion in the admission of new pupils is to be prohibited from today. 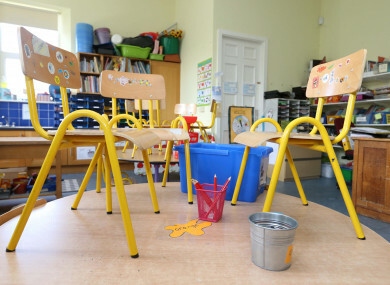 The Minister for Education and Skills Richard Bruton is set to commence a number of broad ranging reforms making it easier for children to access their local school today. The reforms will be introduced when the Minister signs a historic Commencement Order, which will bring sections of the Education (Admission to Schools) Act 2018 into operation. As part of the signing, the Minister will amend the Equal Status Act 2000 to remove the so-called ‘baptism barrier’, which allows schools to use religion as a selection criterion in school admissions. These changes will only impact oversubscribed schools – around 20% of primary schools – which are predominantly located in large urban areas. The order being signed today will also provide the Minister with the power to compel a school to open a special class from 3 December. Commenting on the introduction of the legislation, Minister Bruton said it would ensure “greater fairness” in the way pupils are admitted to schools. He added that while he recognised the right of schools to have a distinctive ethos, the removal of religion as a criterion sought to be fair to all parents. “This hugely important law will make it easier for parents in the future to more easily access local schools and to enrol their children in a school that meets their needs,” he said. Email “Religion to be formally removed as entry-requirement from most primary schools from today”. Feedback on “Religion to be formally removed as entry-requirement from most primary schools from today”.